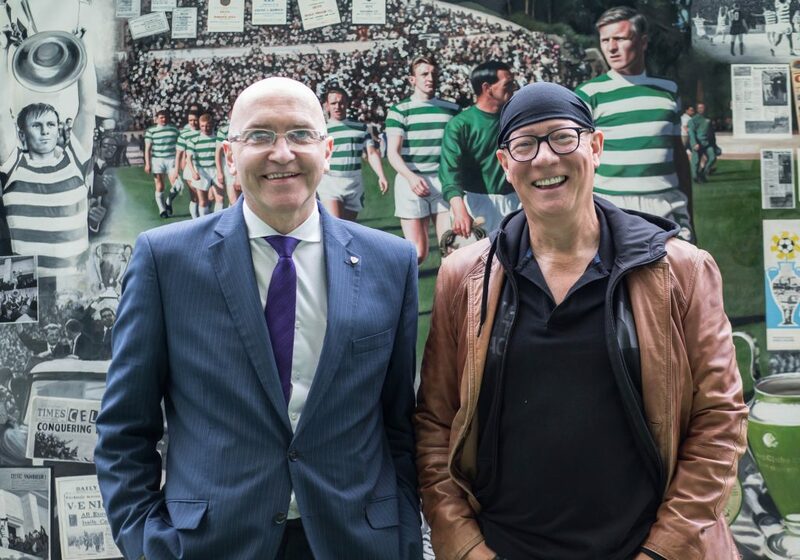 Contemporary Scottish artist, Gerard M Burns has created a stunning, multi- layered, 6‘ x 4’ painting, entitled “Glittering Prize” to commemorate Celtic Football Club’s Lisbon Lions 50th anniversary, celebrating the historic European Cup final 2-1 win against Inter Milan in Lisbon’s Estádio Nacional on May 25, 1967. 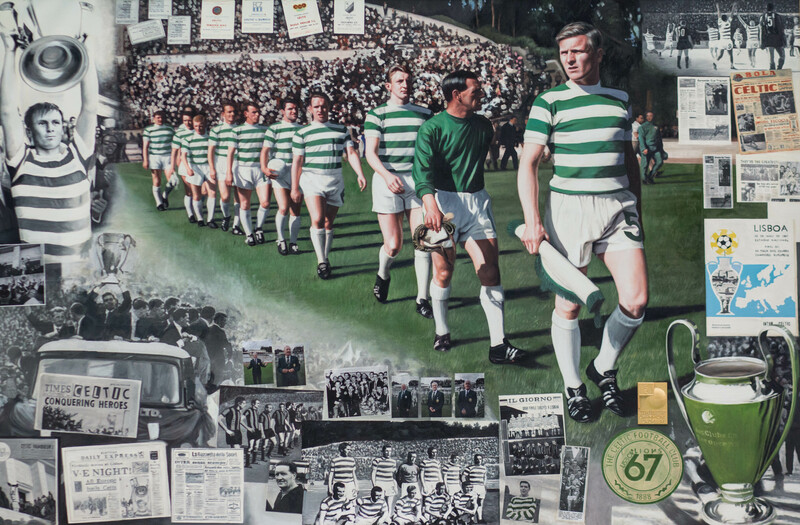 “Glittering Prize” and an edition of 25 prints will be available for purchase through Celtic FC Foundation to raise funds for #LionsLegacy – a fundraising campaign which is raising and distributing funds to Celtic FC Foundation programmes which honour the Lisbon Lions and create a legacy in their name. 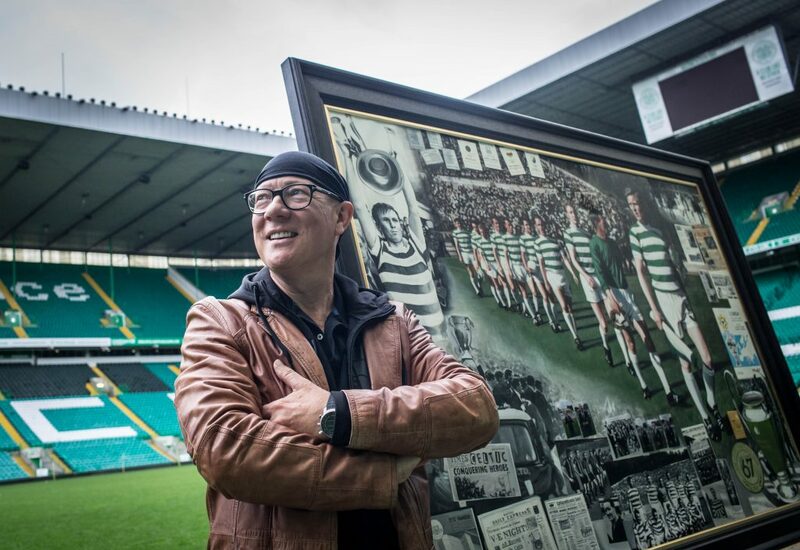 Gerard and Celtic FC Foundation have agreed that 100 per cent of the proceeds from sales of the prints will go towards supporting Celtic FC Foundation’s and Mary’s Meals joint campaign – The 67 Kitchens. Funds from this campaign will fund 67 kitchens in schools in Malawi and emergency food supplies for Aleppo and South Sudan. Each of the 25 editions has been embossed with its own unique version of a specially commissioned replica of the 1967 winners medal (the Glittering Prize). Each print will be sold for £5,000. 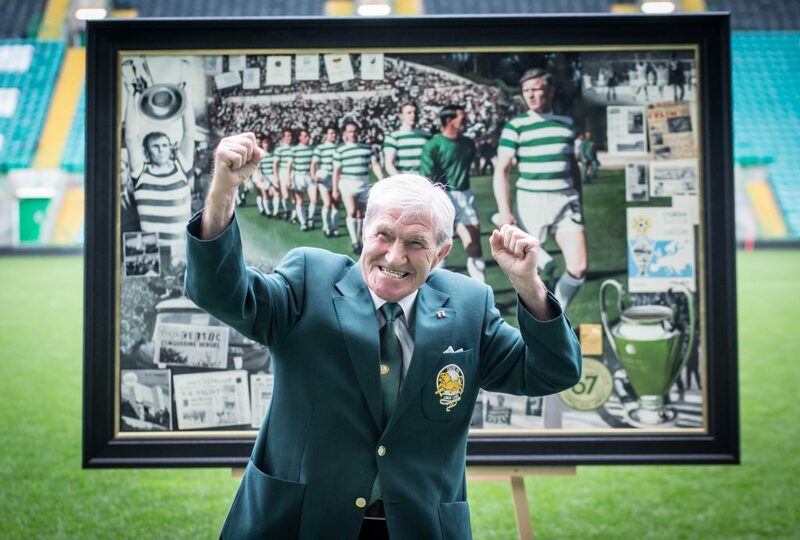 Print purchasers will also be invited to name one of the 67 Kitchens alongside Celtic FC Foundation and #LionsLegacy. The 67 Kitchens campaign will also be a beneficiary of the Henrik’s Heroes v. Lubo’s Legends Charity Match at Celtic Park on 28th May 2017. In addition, a number of Celtic Supporters Clubs and other fans are arranging fundraisers to support the campaign. 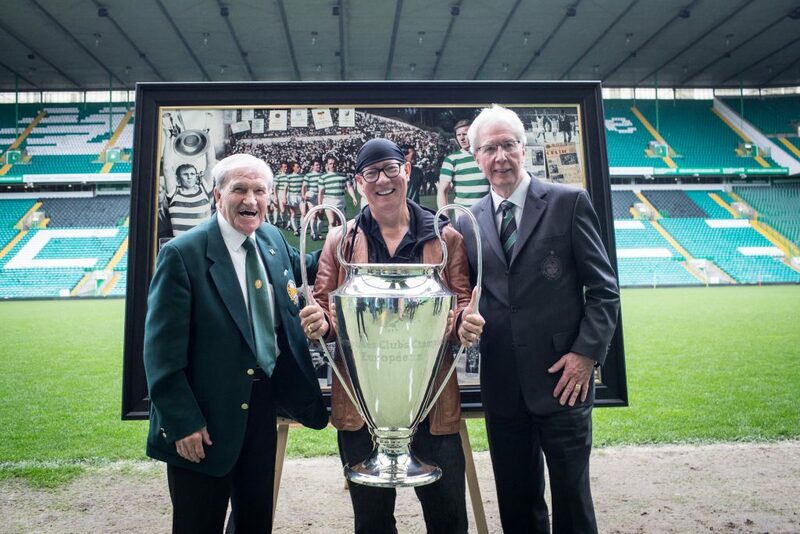 Gerard visited Lisbon with five of the Lions, Jim Craig, Bertie Auld, Willie Wallace, John Fallon and Bobby Lennox along with members of the Stein, Mochan and Fallon families, back in February this year to inspire his vision for “Glittering Prize” and get a first-hand sense of the incredible achievement by 11 Celtic players, all born within a 30- mile radius of Cetlic Park. “It’s been a tremendous season for the Club and the Foundation and we have an exciting few weeks ahead. The 67 Kitchens campaign gives Celtic fans all over the world the chance to unite in the common causes of food for the hungry and honouring our legendary Lions. Lisbon Lion Bertie Auld said: “It’s been a great pleasure for the boys to stay so closely involved with the Club through the Foundation. 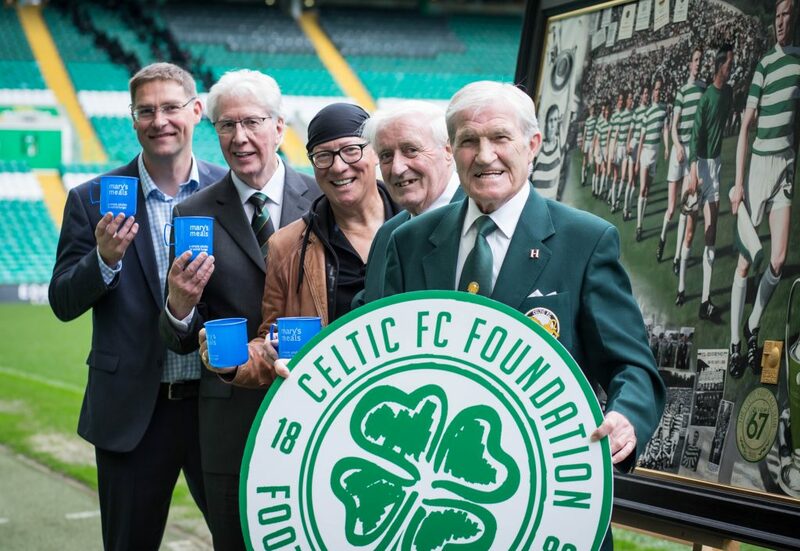 We love to see the founding principles of the Club carried forward and the modern day Celtic and its charitable side rise to the challenges at home and abroad that others shy away from. To purchase a print, register your interest or request further information please contact.